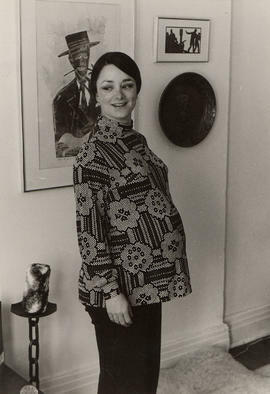 Photograph depicts Cindi Zimmerman pregnant. Property tax statement for the year 1951, from the City of Vancouver for Harry and Esther Seidelman. Statement is dated August 6, 1951. Photograph of Alice, Howard, Edward, and Lawrence Mallek (assumed to be Harry Seidelman's cousins). Photograph of Harry Seidelman's childhood friend, Arthur Laing (right) with three unidentified people. Photograph of Benjamin Seidelman and possibly his friend, Harold McPherson outside Benjamin's family home at 1735 East 2nd Avenue, Vancouver, British Columbia. Birth announcement of Carol Ann Mallek born on May 24, 1938 in Victoria, B.C. Announcement is presented in the form of a theatre ticket.